Last week we told you how smart dogs are. And today you learned some pretty fascinating facts about octopus intelligence. Let’s face it, there are some pretty amazing animals out there, both wild and domesticated. But which ones are the most intelligent? Take the quiz to learn about some of the animal kingdom’s star students. Which of these bird species is considered highly intelligent? Crows have been known to bring shiny trinkets they’ve found as “gifts” to people, while videos have shown crows exhibiting other intelligent behaviors, including using an object to “sled” down the slant of a snowy roof. True or False: Pigs can play video games. TRUE. In 1998, US-based researchers found that pigs could quickly and efficiently learn how to perform the task of moving a cursor on a screen so that it made contact with designated targets, using a joystick controlled by their mouths. They’re called man’s best friend for a reason. Which intelligent task below can dogs do? All of the Above. Yes, dogs do math…sort of. The journal Animal Cognition released research that found dogs may be able to count up to five and also identify when the answer to very simple addition is flawed. True or False: Whales and dolphins have been known to play together in the ocean. TRUE. Video captured off the coast of Hawaii has shown an apparent game where humpback whales repeatedly lift bottlenose dolphins with the tips of their noses, resulting in the dolphins sliding down the whale and into the water. Which species is so intelligent, they’ve been known to beat humans when it comes to number memory? Chimpanzees are intelligent and empathetic animals who use tools to accomplish desired outcomes. True or false: Elephants can distinguish between various human voices according to ethnicity, age and gender. TRUE. Researchers at University of Sussex tested the ability of elephants to identify human voices by having men from two different ethnic groups say “Look, look over there, a group of elephants is coming” in their respective languages. 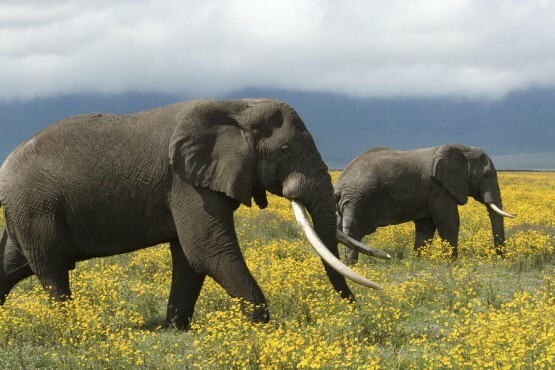 The man from an ethnic group that has a history of hunting elephants prompted a defensive reaction among the elephants, while elephants did not react to the other man’s voice/language. Which birds could be considered “the GPS” of the wild? According to a study published in Science Express, pigeons use special neurons in their brains to encode the Earth’s magnetic field, allowing them to determine direction and position naturally. What intelligent ocean-dwelling animal has been around for hundreds of millions of years? Squid. (Also known as a cephalopod, and related to octopus and cuttlefish.) Its elusive color- and shape-changing abilities and timing, as well as fierce hunting tactics have helped squid survive long after dinosaurs became extinct. True or False: Squirrels are born with the instinct and skills to steal food. FALSE. A 2009 University of Exeter study revealed that squirrels learn food-stealing methods by watching other squirrels, and they grasp new “tricks” quickly. Which barnyard animal can learn its name and comes when called, and also has the ability to delay gratification for a better food option they perceive will come at a later time? Chickens. A University of Bristol study found that chickens have behavioral and cognitive ability rivaling dogs and even children. Its really interesting to see how smart these animals really are, I’ll think twice before I call my dog “stupid”. I can’t believe how smart see animals are I’ll think twice before I call my dog “stupid”! I can’t believe how smart these animals are! Thats amazing! 🙂 I never knew those amazing facts! The quiz was fun to! very hard yet interesting good quiz!